Just learned about Lead Calcium batteries. Found an add from a guy selling a set of them that were purchased in 1974 and says they are still working perfect and should last a lifetime. Obviously, I am sure there is a reason they are not widely distributed today, as far as I am aware, however I am interested to learn if anyone here has had any experience with this type of battery technology. I get excited when I here about a battery that will work for the rest of my life.! Adding antimony and tin improves deep cycling but this increases water consumption and escalates the need to equalize. Calcium reduces self-discharge, but the positive lead-calcium plate has the side effect of growing due to grid oxidation when being over-charged. Modern lead acid batteries also make use of doping agents such as selenium, cadmium, tin and arsenic to lower the antimony and calcium content. Seemed a little to good to be true. In decades past, the only 40 year life telecom batteries I have heard of were those that were cycled to a maximum of 85% state of charge (15% discharge). Can you get a battery brand and model number to look up? In general, calcium was added to lead acid batteries to reduce gasing (used less distilled water). Other than that (less water usage, longer life because of less hydrogen/oxygen generation), there is nothing that (I know of) that would give you 4-5x longer battery life. But I am not a battery engineer. There are batteries that can be nearly "lifetime" batteries--Such as the old Edison Nickel Iron batteries--But even those have some pretty significant maintenance and charging design requirements that make them a bit of a pain. And extremely low charge/discharge efficiency ratio. Something rarely mentioned but very important is efficiency. Water loss in flooded cells is due to: high specific gravity and water loss due to electrolysis (splitting Water into hydrogen and oxygen costs energy) during charging and equalizing. Generally speaking antimony is a problem which gets worse as the battery ages due to the migration of antimony from the positive plate to the negative plate as the battery ages causing ever increasing self discharge until the plates short out, or the self discharge gets so bad you can’t keep them charged. Some claim flooded cells charge faster but in reality they take more power near the finish because they become hydrogen generators as well as energy storage devices. Gel or AGM batteries are more efficient because they don’t have a problem of antimonial poisoning of the negative plates as they use calcium and tin to strengthen the grid instead of antimony. They are sealed and don’t waste power. If you check the published specs on a battery’s self discharge in % you will see a huge difference between flooded and sealed calcium/tin technology. That difference in efficiency is significant over the life of the battery. C & D defines a stationary FLA shallow cycle calcium cell as designed to be cycled up to a depth of 10 to 20% on a daily basis with an occasional discharge of up to 80%, providing long life, up to 20 years and low water consumption due to strengthening the collector grids with a small amount of calcium and tin instead of antimony. Using an oversized jar with lots of room above the plates also allows extended time, up to a year or more between waterings and low gravity electrolyte used in phone company and telcom batteries. Deep cycle FLA on the other hand are designed to be cycled up to 80% every one to three days.due to the collector grids alloy have antimony, or selenium on the better designs as the need for stronger grids on deep cycle golf cart and forklift batteries is to prevent warping of the plates during very high current and high temp daily recharges. periodic equalizing on FLA cells is necessary for two reasons. The “boiling” like action stirs up the electrolyte lifting the denser acid from the bottom of the jar and mixing to get a uniform electrolyte blend thereby preventing electrolyte stratification, for accurate S G testing as well as getting all cells back to the same state of charge after prolonged periods of partial SOC operation at the expense of additional collector grid wear and tear. As antimony grid cells age self discharge increases requiring more frequent equalizing charges and more water consumption compared to calcium/tin grids. I'd estimate that at least 90% of lead batteries are lead calcium. For one thing - calcium is cheap. "At 3%, calcium is the fifth most abundant element in the Earth's crust, and the third most abundant metal behind aluminium and iron." Calcium is a chemical element with symbol Ca and atomic number 20. As an alkaline earth metal, calcium is a reactive metal that forms a dark oxide-nitride layer when exposed to air. Its physical and chemical properties are most similar to its heavier homologues strontium and barium. 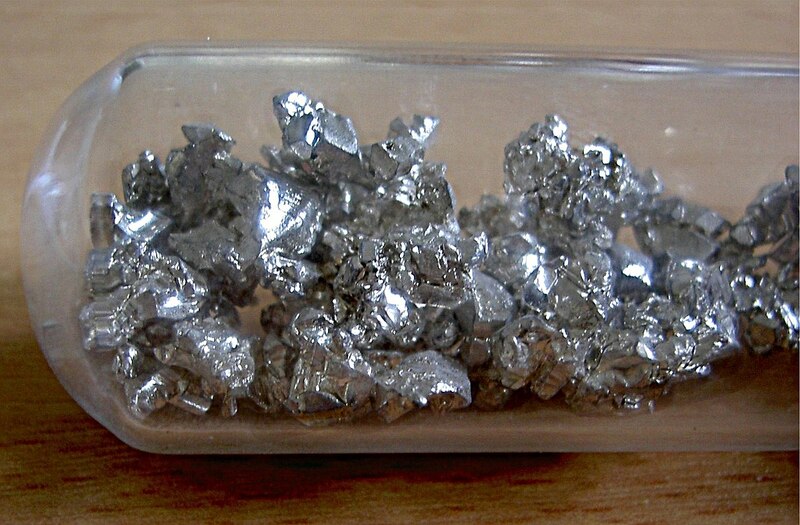 It is the fifth most abundant element in Earth's crust and the third most abundant metal, after iron and aluminium.